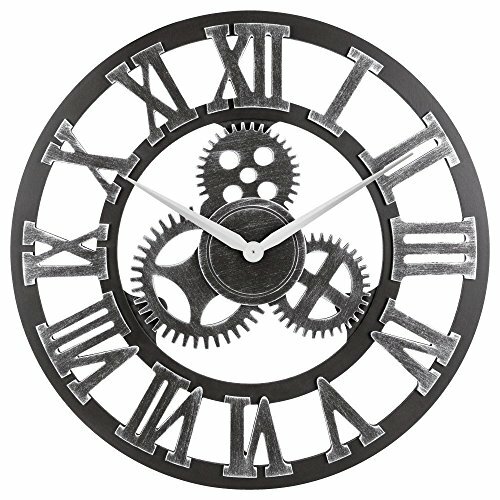 ATTRACTIVE RETRO STYLE: Industrial handmade big 3D gear (Cannot Move) decorative design, great indoor&outdoor decor for metallic rustic look and feeling. HIGH QUALITY: Made of environmentally friendly wood with no second hand, hand painted vintage color. PRECISE ULTRA-QUIET MOVEMENTS: Taiwan Sangtai 12888 Scanning Quartz Movement, NO annoying ticking, promise your sleep quality. LARGE SIZE: Dial diameter: 16"(40cm), best for living room, dining room, kitchen, office, bar, pub, restaurant, coffee house decoration etc. BATTERY USUAGE: Recommended a AA ordinary Carbon Zinc or Heavy Duty battery (NOT Included), exclude Alkaline battery. 1. Operated by 1 AA Carbon Zinc or Heavy Duty battery, not Alkaline battery. 3. After you put the battery into clock, make sure the screw on the minute hand won't be too tight. Because the wheel gear of Quartz won't be moving normally if it's too tight, you can check the back of clock when you got it. 4. Due to the light and the display resolution, pictures and real objects may have slightly color difference, and manual size measure may occurs a little error, please refer to real products.